Introducing glycol into lubricating oils exposes your machines to a powerful and poisonous mixture of chemicals. Unlike other harmful contaminants such as water and dirt, the destructive potential of glycol can progress to massive failure of machine components in a narrow window of time. There could hardly be a more important role for the oil analyst than the routine screening of lubricating oils for the presence of glycol. One large oil analysis laboratory that specializes in heavy-duty fleet equipment deployed in mining and construction reported that glycol was found in 8.6 percent of motor oil samples over a period of years - about one in 12 samples. In fact, oil analysis laboratories have been testing for coolant leaks in used motor oils and other drive train lubes for nearly as long as used oil testing has been around. The techniques vary considerably from lab to lab, as do the alarming limits. This article brings the subject of glycol testing in the oil analysis lab into the spotlight by describing the latest laboratory techniques for detecting and measuring its concentration plus tips for troubleshooting. Glycol, the principle ingredient in antifreeze, is typically mixed with water 50/50 to form a liquid “coolant” to transfer heat, raise boiling point temperature (above 225°F or 107°C) and lower the freezing temperature (below -32°F or -35°C). When additives are incorporated into the formulation, the coolant can guard effectively against corrosion and cavitation. Both propylene glycol and ethylene glycol are used in coolant formulations. Propylene glycol is the choice of some users, because unlike ethylene glycol, it is neither toxic nor considered a hazardous material. Ethylene glycol is far more widely used, however, primarily due to its higher heat transfer properties. This article will focus entirely on ethylene glycol. Antifreeze formulations used as coolants deploy an assortment of organo-metallic and organic additives. These are used to protect metals in the cooling system from corrosion/cavitation, to control scale, to prevent foaming and to maintain pH. Common examples of additives include various phosphates, sodium borate, molybdate, sodium silicate, potassium sebacate and sodium nitrate. Just like additives in a lubricating oil, these additives will contribute to ranging elemental concentrations of sodium, boron, potassium, silicon and phosphorous in the coolant. As will be discussed in greater detail later, the elemental families from the coolant additive system help serve as markers, like DNA, to identify glycol contamination of lubricating oils. Additive treatments used in antifreeze formulations vary considerably between aftermarket suppliers and OEMs that provide the original factory fill and offer supplemental coolant additives (SCAs). There are also marked geographical differences in coolant additive chemistry, influenced by environmental regulations and water quality. For instance, the Japanese use no silicates but large amounts of phosphates. Conversely, the Europeans deploy silicates, benzoate, borate, nitrite and nitrate additive compounds. U.S. formulations employ silicates, phosphates, as well as numerous organic inhibitors. In fact, a major diesel engine OEM has estimated 53 percent of all catastrophic engine failures are due to coolant leaks. For many diesel and natural gas engines, the highest risk of contamination occurs during the time the engine is not operating. In such instances, the cooling of the engine from intermittent use can lead to internal leaks associated with thermal creep, such as at the cylinder heads where there is risk of recession or movement from gasket seals. Higher hydrostatic pressures of the coolant in relation to the lube oil system compound the risk when the engine is at rest. This can lead to a slug feeding of the coolant into the lubricant. Another common source of leakage in engines with wet cylinder liners is associated with a chemi-mechanical perforation of the liners, promoted by vaporous cavitation. This occurs when the liners vibrate violently (on the load side) to the rhythm of piston movement, compression and combustion. This movement causes the rarefaction portion of pressure waves to form negative pressure regions that nucleate vapor bubbles (cavities). 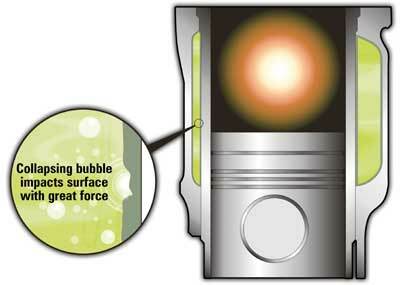 As the combustion chamber fires, the vapor bubbles implode at the speed of sound causing fluid jets and surface pressures as high as 60,000 psi. Such localized energy can literally blast small holes in the protective oxide film on the liner wall, similar to vaporous cavitation in hydraulic pumps. The damage can be further propelled by chemical attack of the nascent metal exposed during this cavitation event. Over time this can lead to perforation of the liner and leakage (Figures 1 and 2). Note, many researchers have postulated on the exact mechanism of damage. While there are variations in theory, there is general agreement that the failure mode is propagated by a combination of mechanical (localized cavitation) and chemical (corrosion of the exposed base metal) attack. 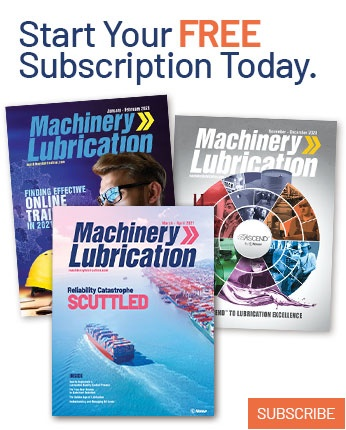 Reprinted Courtesy of Caterpillar Inc.
Certain additives used in SCAs, such as molybdate and sodium nitrite, have been found to sharply inhibit the progress of cavitation corrosion. If the liner’s protective oxide film becomes delaminated by the cavitation energy, the additive reforms a barrier film to stop further progress. The concentration of these SCAs introduced to the coolant blend is important however. An undercharge can result in accelerated pitting while an overcharge can cause coolant gelation, lead-based solder corrosion and other problems. Glycol is an all-around bad guy when it commingles with oil. The problem is intensified by coolant water that enters the lube system at the same time as glycol. Evidence of glycol contamination is often seen by mechanics charged with the responsibility of repairing the damage it causes. For instance, main and connecting rod bearings may become darkened, almost charcoal in appearance, when glycol has contaminated diesel engine crankcase lubes. Owing to the fact that glycol is not soluble in mineral oil and that the thermal conditions within engines lead to the transformation of the glycol and coolant additives to an assortment of other chemicals, it is no surprise that there are so many degenerative consequences. Following is a discussion of several common and a few not-so-common symptoms or harmful effects of glycol leakage and contamination. It was previously mentioned that coolants could corrode and erode the walls of cylinder liners. This can result in pinhole perforations. When an engine is at rest, the combustion chamber within the cylinder can literally be flooded with coolant passing through these holes. Later, when cranking the engine, the lack of compressibility of the coolant can cause hydraulic lock, like deadheading a pump. Since the coolant has nowhere to go, bearings, rings and/or rod failure can occur. Under normal operating conditions, ethylene glycol oxidizes to form organic acids such as glycolic acid, oxalic acid, formic acid and carbonic acid. Typically the reaction rate doubles for each 18°F (8°C) in temperature. These acids contribute to secondary and tertiary effects as further described. However, their presence alone in lubricating oil can jeopardize bearings and other frictional surfaces. The corrosive conditions can pit the clad surfaces of the lead/tin overlay of journal bearings, promote rust on steel and iron surfaces, and tarnish cupric metals of bronze and brass. One study found that even a small coolant leak in a large integral gas engine/compressor was enough to severely corrode engine steel and copper surfaces. 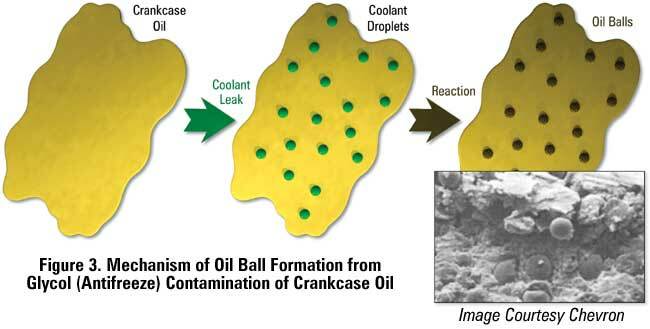 Chevron and other researchers have reported that when glycol-based coolants thermally age in crankcase lubricants oil balls form, largely from the reaction of the glycol with oil additives. The additives involved include sulfonates, phenates and ZDDP (Figure 3). 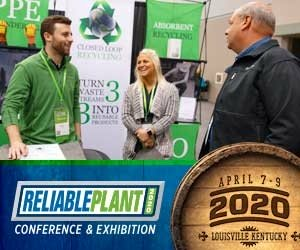 This is further evidenced in a study by the Fleetguard filter division of Cummins Engine that reported as much as 77 grams of filterable solids are formed when oil is contaminated with coolant containing ethylene glycol at a concentration of just two percent (Figure 4). 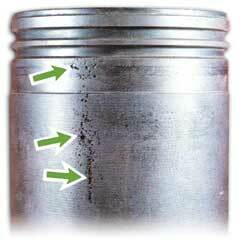 The acids and water that form in crankcase oil as a result of coolant contamination will often disrupt soot dispersancy, even at low soot loading. Fleetguard reports “75 percent of filter plugging complaints from customers involved coolant or moisture in the crankcase.” Once soot begins to dump, a chain reaction of associated failures can result, including loss of antiwear protection, sticky sludge on valve deck surfaces and carbonaceous deposits on ring grooves, piston crown lands, valve train components and oil ways to bearings, etc. 1. Coolant leaks into the crankcase oil. 2. Acids and precipitants form as the glycol, coolant additives and lubricant additives react. 3. These insolubles begin to plug the oil filter. 4. Concurrently, the acids and water disrupt soot dispersancy causing a dumping condition. More sludge and insolubles form. 5. By now the filter is plugged with the glycol transformation by-products and coagulated soot. 6. The oil and filter are changed (typically around 15 percent of the old oil remains, either in the oil pan or occluding to engine surfaces). The new oil (with detergents and dispersants) mobilizes the soot and the sludge, carrying it to the filter. 7. Once again, the filter becomes plugged (even with the coolant leak fixed). Astute mechanics, lubrication technicians and operators are always on the lookout for the telltale signs of a lubricant contaminated with coolant. In truck, bus and mobile equipment fleets, the first sign might be white smoke billowing from diesel engine exhaust pipes. Or it might appear as a shiny adherent sludge having the consistency of mayonnaise on a used filter during a routine change out. Perhaps as previously mentioned, the oil pressure in a diesel engine runs unusually high only minutes after an oil and filter change. One test that has gained renewed attention is the blotter spot test. 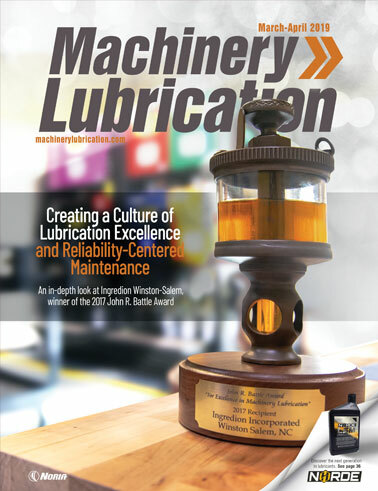 It first appeared on the lubrication scene as a field test dating to about 1880. It reemerged in studies conducted by Shell Oil in the 1950s and now again it seems to be catching the attention of even the most sophisticated oil labs. Because of its simplicity, the test is easily conducted in the field, although time is required for the results to fully develop. The test is based on the established procedure of paper chromatography and involves placing a couple of drops of used oil on common blotter paper (available from lab supply catalogs), or even the back of a business card. Let the drops soak into the paper for a couple of hours. If a dark or brownish stain is left in the center after the oil absorbs outward, then this could be disrupted dispersancy and soot coagulation, a common consequence of glycol contamination. A black sticky paste with a well-defined (sharp edge) periphery is cause for serious concern. Very often a soot ring develops around a yellow/brown center when glycol is present. Figure 5 shows this unique pattern on blotters developed from used diesel crankcase oil that was thermally aged in the presence of varying concentrations of glycol and water. When passing a small amount of solvent-diluted oil through a one-micron membrane you will often see sludge, additive precipitants and other insoluble contaminants present on the membrane surface. The use of a handheld 30-power microscope can help in the examination of the material present. Field patch test kits are available from several suppliers. Note if the membrane pore size is too large (>3 microns), much of the sludge and insolubles will pass through. The use of a 0.8 mm patch is recommended. Also avoid the use of solvents that risk dissolving condensed oxides and other target materials from glycol-contaminated oil. The Schiff’s reagent method (ASTM D2982) is a colorimetric method for detecting trace amounts of glycol in lubricating oils. In this method, a solution of hydrochloric (HCl) and periodic (HIO3) acids is introduced to the oil to oxidize any glycol that may be present. The reaction produces an aldehyde, which in turn reacts with the Schiff’s reagent, yielding a positive color change from colorless to pink/purple - the darker the color, the more glycol present. There are several suppliers of Schiff’s reagent test kits. Please note, false positives have been frequently reported from the presence of trace impurities in new oils. Chevron has documented this effect as being due to residual traces of glycol in new oil from lubricant additive manufacture. However, others have reported that it might also be due to aldehydes and ketones from base oil refining, despite the published Chevron data. This makes sense because new oil can show a positive with Schiff’s before oxidizing with HIO3. In another case, the Cummins oil analysis lab reported that it ran successive tests on a single sample of used oil that yielded results that were positive, negative and indeterminate. Because of the instability of ethylene glycol in lubricating oils at high sump temperatures, it is rapidly converted to acids and other compounds. Because this and other test methods discussed below rely on the presence of molecular glycol, any chemical or thermal decomposition of the coolant can make the Schiff’s reagent test unreliable. Lab tests by Cummins show that “an oil containing four percent coolant will retain only 10 percent of the glycol originally present upon heating at 200°F (93°C) for eight hours.” However, other telltale signs for glycol contamination do remain in the oil. Many oil analysis laboratories use this procedure for analyzing used oil molecular properties routinely. Practicing Oil Analysis magazine has covered infrared spectroscopy in several issues. Common target properties detected and measured with FTIR include soot load, water contamination, fuel dilution, oxidation, nitration and sulphation. Many labs also report absorption bands commonly associated with ethylene glycol. While there is much merit to including glycol among the various properties reported by infrared, there are also interferences and lower sensitivity limits that labs and users need to be aware of. The interferences relate to other properties and contaminants that share common spectral absorption regions with glycol. For instance, the strongest band for glycol, a broad region around 3450 cm-1 corresponding to the O-H functional group, is also cohabited by water and other alcohols that have similar functionality. Because water is blended with antifreeze (ethylene glycol) to form coolant, the distinction is often impossible to make. There is however, a more unique band for ethylene glycol at 1070-1030 cm-1 corresponding to the C-O functional group, that is commonly used because there are fewer overlapping bands from other oil contaminants and degradation by-products (Figure 6). The main risk in this region is associated with certain additives (such as barium sulfonate) and oxygenated compounds (ethers, lactones and alcohols) from base oil and additive degradation. As with water contamination, there is very limited ability using FTIR to detecting glycol concentration below 1,000 ppm. Just like the Schiff’s reagent test, FTIR also relies on the presence of molecular glycol. However, because glycol can rapidly degrade chemically and thermally as previously mentioned, its presence in used oil may be completely disguised. In this instance, for FTIR to be successful, an astute analyst would need to recognize the absorption bands of glycol’s several transformation products. There has perhaps been no analytical method that has had a greater impact on petroleum analysis than gas chromatography (GC). In the realm of used oil analysis, it is widely held to be the most accurate method for detecting and measuring glycol and fuel, although more costly and time-consuming than alternatives. The most commonly used GC procedure for glycol analysis is ASTM 4291, “Standard Test Method for Trace Ethylene Glycol in Used Engine Oil” (Figure 7). The procedure involves first extracting the glycol from the oil using water followed by centrifugation. The extract is then removed and injected into the GC where the polar compounds are separated and detected on a chromatogram. Note, this procedure has been reported by Chevron to be so sensitive that it can give false coolant leak indications. This is due to the presence of additive manufacturing by-products and fuel contamination that can leave trace levels of glycol in new and use oils. It is helpful to baseline new lubricants using GC before deploying the method with used oils. The major drawback with GC detection of glycol is that glycol can rapidly decompose into acids, aldehydes and esters which can result in a false negative or understatement of the true concentration of glycol and glycol derivatives. This is also true for Schiff’s reagent and FTIR tests. Elemental analysis by Inductive Couple Plasma (ICP) emission spectroscopy or by arc-spark Rotating Disc Electrode (RDE) emission spectroscopy has been the mainstay of the oil analysis lab for years. The use of elemental analysis is perhaps the single most reliable method to verify that glycol or its derivatives have contaminated a lubricant. The procedure is keyed to detecting the presence of organo-metallic antifreeze additives that become blended with a lubricant on contamination. These elemental markers are telltale signs that the oil has received a dose of antifreeze. For instance, sodium, boron, potassium and silicon are commonly found in antifreeze formulations (Figure 8). In order to know specifically which additive elements and their concentrations are found in new or used antifreeze (included blends containing SCAs), a sample could easily be analyzed in the same way as used oils. Of the different compounds that make up antifreeze additives, sodium and potassium compounds are the most stable, even though there is risk that they will precipitate and be removed by the filter. Boron presents a risk of evaporating at typical crankcase sump temperatures, while silicon from a coolant leak may be confused with dirt ingression or oil antifoam additive. See the sidebar for developing a calibration curve for glycol contaminant levels using sodium against various antifreeze concentrations. Due to the loss of sodium from oil consumption or by insoluble sodium captured by the oil filter (80 to 90 percent of the total sodium that has leaked into the crankcase in some instances), an increase in sodium in the oil by as little as 50 ppm can mean as much as one gallon of coolant has leaked into a 10 gallon (38 L) lube oil system. 1. Using an ultrasonic bath, transfer the particulates from a piece of the filter media to a solvent such as kerosene or mineral spirits. 4. Transfer the residue to a glass slide and analyze the particulate matter using chemical microscopy. When a sudden increase in sodium is observed, the analyst needs to be aware of other common sources. These include: salt and saltwater, grease, dirt, fly ash, sodium hydroxide, etc. For this reason, other members of the coolant additive family may be needed to confirm the contaminant is antifreeze, such as boron, potassium, silicon and phosphorous, bearing in mind that some of these elements may also be oil additives. Setting alarms and limits for glycol is difficult because of the different oil analysis instruments in use and the transient states of glycol in the lubricant. To the extent that the analyst can confirm a coolant leak, no matter how small, the matter is of serious concern. However, false positives can occur if the alarm limits are set too low for the reasons previously discussed. Likewise, if the alarms are set too high, the actual coolant leakage levels could be several times higher than the measured amounts and the engine may be dangerously close to catastrophic failure. In the case where false positives occur as a result of new oil chemistry associated with additive manufacturing and base oil refining, the interferences that cause these false positives often burn off during service. Hence a new reference oil or an oil placed into service a short period of time may test positive for glycol, then later test negative. 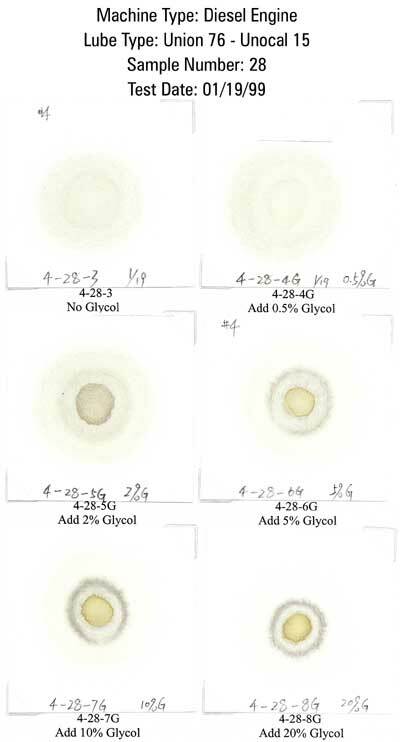 When a false positive due to oil chemistry occurs in labs that report the result of a glycol test (Schiff’s reagent, FTIR and GC) they are typically bound to place a positive indication on the report. However, based on their review of other indicators (including coolant additive elements) as previously discussed, the analyst commenting on the oil analysis data should emphasize that the positive glycol result is not a cause for concern. Some labs use the approach of reporting coolant or antifreeze contamination instead of glycol to eliminate this potential cause for unwarranted concern. The same principle holds true in the case of a negative glycol test where its presence is disguised by the fact that it has converted to by-products. Looking at other indicators such as sodium and potassium, the analyst should report a positive for coolant contamination despite the fact that no actual glycol was detected. In such instances, the lab analyst is making a contamination entry determination based on review of multiple factors. In general, glycol above 200 ppm in most cases is considered reportable. Levels greater than 400 ppm should be regarded as significant and levels as high as 1,000 ppm flagged as critical. 1. Drain oil from compartment and all lines and components. 2. Install new filter elements. 3. Mix an ISO VG 32 R&O mineral oil 50/50 with Butyl Cellosolve. 4. Use the mixture to turbulently flush (using an external pump installed at the turbocharger supply line or other suitable pumping method) internal surfaces by ample flow and volume for one hour at a temperature not less than 70°F (21°C). 5. Drain the system completely, mop out crankcase and replace filters. 6. Repeat steps 2 through 5, using a 60 percent R&O 32, 40 percent kerosene mixture. 7. Remove and inspect all main bearings, journals and other engine surfaces. 8. Remove the external pump and recharge with the correct lubricant. Replace the filter. 9. Monitor the engine carefully until all conditions stabilize. Anonymous (Phillips 66). Cleaning Procedures to be Used When Lube Oil Systems are Contaminated with Ethylene Glycol. Annual Book of ASTM Standards, 2000, Section Five, Petroleum Products, Lubricants, and Fossil Fuels. Beal, Roy E. (1993). Engine Coolant Testing, Third Volume, ASTM. Birke, Mike - Southwest Research Institute (1999). “New Challenges in Detecting Glycol Contamination with New Anti-Freeze Additive Formulations,” Practicing Oil Analysis ‘99 Conference Proceedings. Booser, Richard E. (1997). Tribology Data Handbook, CRC Press. Caterpillar, various S·O·SSM Services publications. Coates, J.P., and Setti, L.C. (1985). Oils, Lubricants, and Petroleum Products, Characterization and Infrared Spectra. DEKKER. Hudgens, R. D., and Feldhaus, L. B. - Fleetguard, Inc., (1978). “Diesel Engine Lube Filter Life Related to Oil Chemistry,” International Fuels & Lubricants Meeting, Society of Automotive Engineers, Toronto. Mathys, Mark - Butler Machinery, Caterpillar (1999). “Coolant and Coolant Analysis,” Seminar Course Materials. Peterson, F.S. (1979). Lubrication - Chromatography. Texaco, Vol. 65. Staff editor. (1999). “Schiff’s Reagent Glycol Test - Controlling False Positives,” Practicing Oil Analysis magazine, November-December.